Beautifully designed websites starting at only $795! Easily add, edit and delete your horse sales listings to attract new and existing buyers on a regular basis. Stand out in a crowd! Raise the standard in your industry with a website that will help you gain new customers . 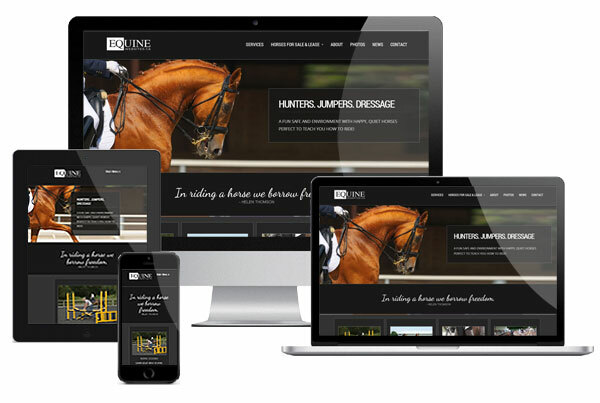 Mobile Friendly Equine Website Design – For Riders, By Riders! We understand the importance of proper presentation. We also know that there are not enough hours in a day when you work in the horse industry. We will build you a “winning” website, promptly, so you can focus on what you do best – riding lessons, training, horse shows and horse sales. Starting at $795 we’re sure you’ll find a solution that will fit your budget. You can also “add-on” design and development hours to tailor your site just to your liking. We all know the importance of photos and videos when trying to sell horses online. Our solution makes it easy to put your sales horses in the spotlight! Promote Your Show Results, Sales & News! Don’t be afraid to tell the world how well your trainers and show horses competed last weekend! With our content editor we make it easy for you to share your exciting news. Website security, regularly scheduled back-ups and software upgrades. We’ll handle the boring technical stuff that keeps your site running smoothly. Our Equine Website Design Services Are The Best You Will Find On The Market Today And We Can’t Wait To Work With You.